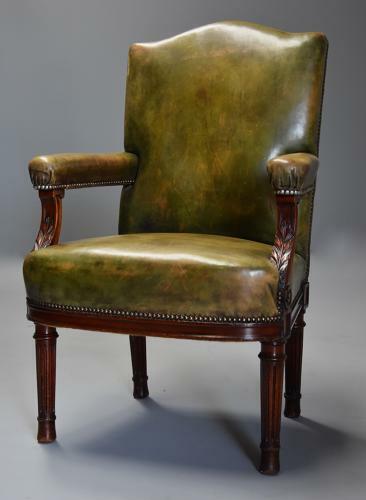 This chairs consists of a shaped top rail with an upholstered leather back, seat and arms, the arm supports being shaped and carved with leaf decoration. This leads down to a shaped and moulded seat rail with recessed square panels to the side rails at the top of both the front and back legs, all four legs being turned and fluted. This chair is in excellent condition for age, is of stable construction and can go straight into a home - this is a comfortable chair so could be used as a lounge or desk chair.